So I ran into This Mortal Coil on a list of books one should finish before the end of 2017. The premise seemed interesting. Like it would be directly up my alley. So essentially, the protagonist, Catarina, is on her own in the forest two years after a massive pandemic has forced most people into underground bunkers. She can’t join the people in the bunkers because she’s running, in the panel in her arm that runs apps, code that wasn’t approved by the corporation who essentially created the panels. One of the conditions of entry is that the company can delete all tech that isn’t standard. One day a soldier from the company shows up at Catarina’s door. He comes with the intel that her father created a vaccine for the virus that either wiped people out or sent them into hiding. But she’s the only one who’s got the skills to decrypt it. All hell breaks loose, and there you have it. 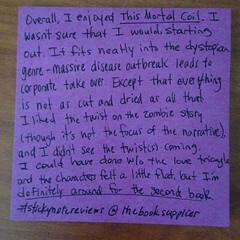 Overall, I enjoyed This Mortal Coil. I wasn’t sure that I would, starting out. It fits neatly into the dystopian genre – massive disease outbreak leads to corporate takeover. Except that everything is not as cut and dried as all that. I liked the twist on the zombie story (though that wasn’t the focus of the narrative), and I didn’t see the twist(s) coming. I could have done without the love triangle, and the characters felt a little flat, but I’m definitely around for the second book. 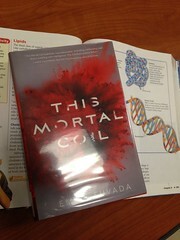 Have you read This Mortal Coil? Does it sound interesting to you?